Hello, my lovelies. I hope you’ve had a wonderful week. I want to start out by saying thank you for all the love you gave me about the passing of my sweet, old dog, Murphy. Your kind words mean the world to me. I can see that a lot of you share the same love of animals that I do. As for today’s post, I’m not feeling particularly talkative. I mostly just wanted to post a few photos that I took the other day. 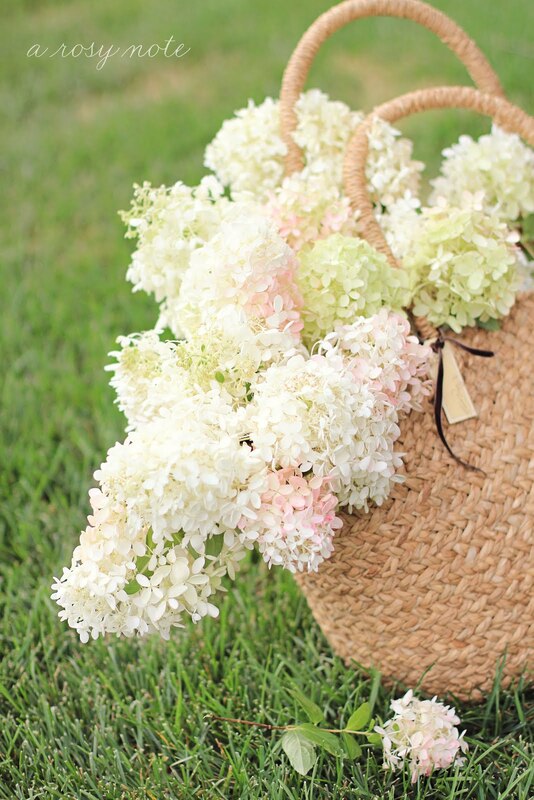 My hydrangeas are starting to fade, so I thought I’d cut a few and put them in this pretty woven bag. When life gives me flowers, I take pictures. The light was so nice. It had that warm glow that sunset brings…little bands of gold twinkling through the leaves. It’s been rather dry this summer so some of the leaves are starting to fall. It makes me think that autumn is just around the corner. Although it’s such a pretty season, I wish summer didn’t end so soon. Thank you for sharing some more beautiful images, Tricia. I love your first picture – it's so romantic! This year we had not very often nice weather, so I also enjoy the last days of summer with the last flowers, warm temperature at the time being! Beautiful hydrangeas, love the soft colors! This Summer has been so enjoyable it's hard to say goodbye so soon! Always a delight for the eyes when visiting your blog. Thank you for the delight!! I wonder what variety of hydrangea you have. Mine are blue or purple and I have seen pink. But your white ones are lovely! These are so pretty and so wonderfully photographed. The pale colors of these hydrangeas are so different from what we have around here. They look perfect sitting in that woven basket. Yes, beautiful flowers to have the ability to soothe. They are quite lovely. Thank you for sharing them. And I'm so sorry about the loss of your most beloved Murphy. We lost our 17 1/2 year old beagle about 2 years ago. He would have 20 tomorrow. We still haven't found a doggy to fill his spot. I hope you have a beautiful, beautiful weekend. Tricia, these are so beautiful. Each of them is composed so perfectly. What beautiful images, Tricia! When I see hydrangeas like this, I must admit I'm envious. I've never seen hydrangeas bloom like that in this part of the country. Your photos are exceptional, as always. Wonderful composition. These pics make me happy. The basket is the perfect container! These are really VERY pretty. Tricia, these are just divine! Hope you have a fun filled weekend. So pretty! I love the different set-ups you have. Beautiful! I'm so sorry to hear about your wee dog!!!! Gorgeous Photos!! I love hydrangeas! Beautiful, beautiful, beautiful Tricia! Thanks for stopping by…hope you have a wonderful weekend, too! I am loving this cool weather! So so lovely. You mention that autumn is on the way – this will be my first "autumn" in Singapore where it is non- existent. It is basically the exact same weather all year round. I am not complaining about sunny warm weather – but I am an autumn girl…boots and scarves. Such gorgeous photos. I just love hydrangeas, But it is to hot here in the desert for them. So I sit and drool over your lovely photos. I am kind of excited for fall to get here. It will be nice to be able to sit outside in cooler weather once again. HOpe you enjoy your weekend. I just wanna say 'Thank you'. Nice hydrangeas! hmmm,,,,,sorry about your dog…..they are good friends….. I can't wait until our hydrangeas get big enough for me to pick them and enjoy them! We just planted them this year, so it'll be a while. Sometimes I think that Hydrangeas are even prettier when they start to dry…yours are georgous. They look amazing in the basket. Such lovely, lovely photos. very b.e.a.u.t.i.f.u.l.. Tricia!!! So soft and pretty! Lovely photos as always, Tricia! The colors of the hydrangeas are so sweet, and yes, the lighting is beautiful. I love hydrangeas. They are one of my fav flowers. I always LOVE your beautiful photos Tricia! Your hydrangeas are so lovely. Mine are now blooming too and I am enjoying them so much on the bush before I cut some to make wreaths. I think this flower is why I love August so much. Thank you so much for stopping by my place, I love it when you visit. Tricia — These are so lovely! You have such a great eye and technical know-how to match. Have you ever thought of selling your photos? The stock photo companies pay for great photos. There are all kinds of categories. You should look into it. SOOOOOOOO PRETTY Tricia! You have such a way of staging and composing your photos! A true artist! Your photos of your hydrangeas are so pretty! Up north, the trees are already starting to turn color. I love the beauty of autumn, but like you, hate to see the summer end already. I absolutely love your photos. I love how you can make something so simple look so elegant. Oh my goodness these are just gorgeous!! I agree your photos are awesome! Darling Tricia your photos are marvelous, as your hydrangeas!! I like their faded pink… Please could you tell me their name? I've been using a Canon that my friend doesn't use anymore. It's a very old one, but has the big lenses. I love it. So I think I'm more than ready to by the T3. Such gorgeous compositions! 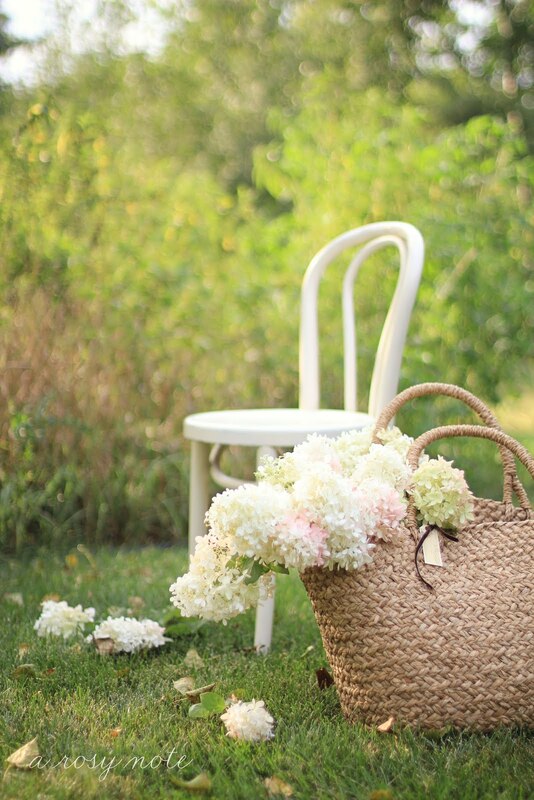 You've captured the essence of summer hydrangeas in such a beautiful way in that gorgeous light. I love when everything comes together perfectly. Your photos have transported me and made me feel all dreamy inside. Thank you! Such gorgeous photos. I wish I had some productive hydrangeas to bring inside. Beautiful setting with the chippy chair and basket, too. I've shared your story of Murphy with so many, it was so sad to read. I hope you are doing ok, I think of you often. Oh, Tricia, so sorry for your sweet Murphy, it's so difficult to loose a beloved pet, I know it hurts a lot. 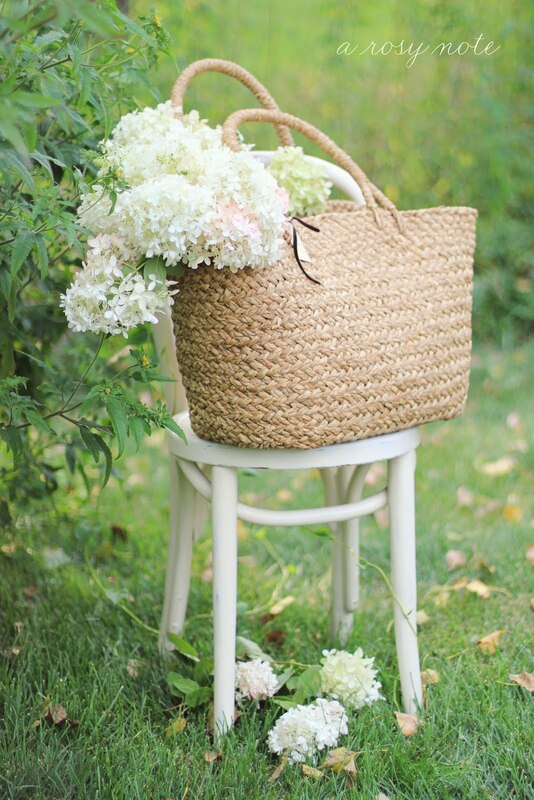 Your photos are always so gorgeous, love the setting with the chair and beautiful basket full of hydrangeas. You are very talented. That's a perfect way to display hydrangeas! Ours did so well this year but they are not quite ready to cut for drying. I fill the house up with them to enjoy the rest of the year. Such a treat for the eyes, Tricia. I so wish I had hydrangeas . . . I may have to buy some. Your photos are stunning, as usual. Gorgeous photos, I love your beautiful Hydrangea! it's paniculata 'vanilla fraise'? I will say also to Silvia, Shabby Soul my new friend!!! Your pictures are beautiful! I just found your blog. Do you mind if I ask what kind of camera you use? Thanks! Love the blog..
WOW, such beautiful hydrangeas…with the crazy hot summer we had this year, mine just didn't do all that well. Your photos are so very pretty!!!!! So sorry to hear about your dog. So pretty Tricia, thanks for your kindness. We spent the day unpacking and watching the boys play soccer. Hope you are having a good weekend. 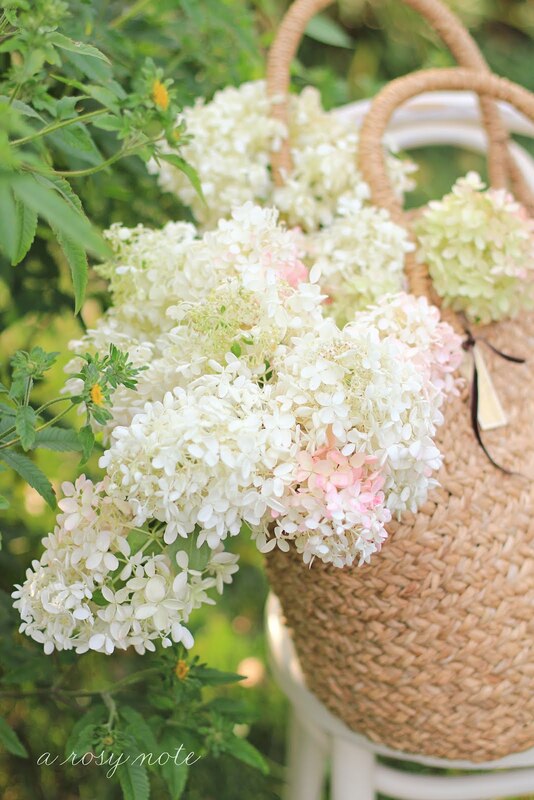 Such beauty in your bag…..my all time favorite flower.